History was made in 2009—though some may not have realized. During that year, for the first time ever in such a public display, the FBI was overtly and clearly revealed to be deliberately creating false terror events and using corporate media as a tool to spread fear and hysteria nationwide as they promoted these fictitious events as authentic. The issue of violent terror attacks in the world has been a major issue now for decades. Every one of these attacks is tragic, inexcusable, and yet completely avoidable, in my view. If we were among the few who still frequent corporate media, we might believe these events were organically created by troubled and dangerous people from questionable backgrounds, and in some cases this might be partially true. However, the usual M.O. of the MSM is to deliberately omit the most important piece of this puzzle. That piece consists of the extensive efforts of Western corporate contractors, the CIA, and other U.S. agencies instigating and exacerbating foreign conflicts. These interests do this in order to destabilize governments—partially by manipulating the general public into violence—and then using the societal conflict as an excuse to establish a new controlling regime in that country. Whenever the U.S. uses this tactic in foreign nations, the action is simply phrased as spreading democracy. Beyond the cheap euphemisms, the U.S. is known for using the excuse of expanding this democracy in order to apply the Hegelian dialect to other nations. They commonly create a problem, manufacture an outrageous public reaction using both willing and unwilling/ignorant participants, and then to rush new policies into place which are only advantageous to the elitist organizations that orchestrated the manipulation to begin with. We might add that this manipulation has been a common practice both domestically and overseas. Though some may be surprised by the realization, it appears to be these same manipulative tactics by the U.S. three-letter agencies and their corporate backers that have been used here in the U.S. to achieve the same regime change that we have seen in foreign nations for years now. Once again, this agenda is being shown to be significantly detrimental to the people, and yet completely advantageous to the same elitist powers that have benefited in the past. 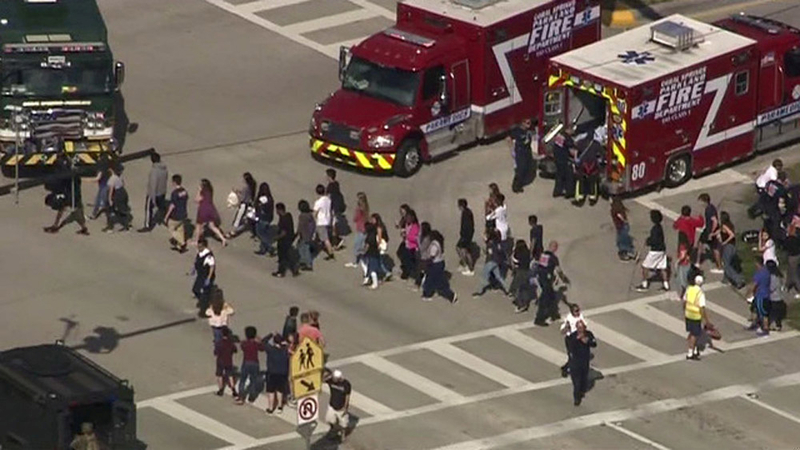 The recent school shooting at Parkland, FL showed several of the exact same signs of all of the other alleged false flag events in the U.S. and in other nations. Just as in most other cases, the talking points before the series of high school shootings were the exact same points as we have heard in past politically driven agendas in MSM news. We might keep in mind the obvious fact that news, by definition, is supposed to be objective and unbiased in its reporting of the facts, and yet virtually all of the MSM coverage is riddled with bias and politically driven narratives of abolishing the second Amendment. This agenda was the same one which preceded and which followed several other corporate news charades which were promoted as news. However, these reports also appeared to be little more than dramatizations or largely concocted events used as an excuse to disarm and abolish the basic rights of United States citizens, according to multiple independent journalists. This agenda has been a long-running, emotionally manipulative, and violent effort—complete with coordinated shootings, apathetic police and swat teams, and countless news cameras—to coerce the American people to give into fear and surrender our constitutional rights. The event itself has not entirely been proven positive a false flag. However, it has been proven that the rights of Americans have been gradually and consistently ebbed away ever since September 11, 2001. We will delve further into this subject in a moment, but first, here is the video of interest. This is an excerpt from the HBO documentary, The Newburgh Sting (some language included). In truth, it is arguable whether or not these events were the first overtly false terror orchestrations of their kind. However, it is difficult to argue how well documented and well coordinated this particular FBI fabrication was. To clarify, this investigation was an actual FBI operation in which a hired patsy whose supposed job was to find "terrorists" in the United States. Only in Newburgh, none of the patsy's marks were actual terrorists. In fact, none of these men had any interest in being terrorists, though they were impoverished and in dire circumstances, as stated by the documentary. This eventually made them agreeable to hefty bribes. The only way in which any of these impoverished people even thought about working with this man was if they were promised to be paid $250,000 each. It should also be noted that none these men seemed to have considered any of the details an actual terrorist or arsonist would consider prior to committing an act of violence. They were completely unarmed, they had no escape plan, no alibi, and demonstrated a lack of technical capacity to complete any of the actions they were accused of. Just in case the facts escaped some, let's break this down a little further. We know that legally speaking, in any court case, there must be a solid and tangible link between the perpetrator(s) of a crime, the means, and the plan to commit the crime in order to get a legitimate conviction. It must be proven within legal grounds, that the defendant or defendants had the tools, the motive, and the actionable intent to commit the crime or crimes in question. This is not to mention the fact that the suspects actually need to commit a crime in order to be punished for one. We may also know that if defendants are tried as independent participants with no outside influence or coercion to commit these acts, there must not actually be any outside influence. However, as we know, there very much was an outside force coercing these men into questionable acts. The court case discussed above fell far below the standards of the actual American court system. The courts ignored the fact that the FBI committed the crime of entrapment and if they had left these men alone, none of their benign actions with fake bombs and an inert missile setup would have ever taken place. However, the courts chose to act on emotion instead of the case presented to them. Though according to testimony, some of these men had issues with the law in the past, the facts showed that they had no opportunity to ever commit acts of terror such as the FBI simulated, but, again, this made no difference to the courts. Just as it is unjust for the U.S. to bomb and invade a foreign country under false claims (such as "weapons of mass destruction"), it is unjust to lock human beings up for decades simply because they fell for the scams of U.S. government. However, this did not stop the FBI and news sources from patting themselves on the back. It seems clear that MSM news had no interest in reporting the entire truth of these events. Instead, the entirety of corporately sponsored news omitted key facts in order to push a political, self-interested narrative. This agenda was to simulate the need for drastic, unconstitutional measures to prevent violent events in the U.S. that were virtually nonexistent—at least nonexistent without the helping hand of the FBI, CIA, or Homeland Security. These actions of the FBI speak extremely poorly of the legitimacy of certain government agencies. These agencies—or elements within these agencies—seem to have so outlive their former usefulness that many of them have now become more efficient at causing the problems they once worked to solve. In all of this, we might keep in mind that most FBI agents don't simply decide one day to stop working for honor and integrity, and to instead, work for their own wealth and benefit. This level of compromise typically builds over time, and must either come from significant bribery or blackmail (or possibly both) of various agents, according to sources. According to the American method of foreign manipulation of governments, bribery and blackmail have been common tools of the trade. It is believed by Western corporate manipulators that all foreign government officials have their price when it comes to compromising their seat of office. In fact, many independent journalists have found that the FBI, the CIA, and multiple other agencies with spotty histories have been busy dirtying their hands in recent years as well. Just as independent operatives are used to manipulate foreign countries, these same tactics have allegedly been used to create terror events in the United States, including—but not excluded to—false flag shootings, bombings, and various other acts of violence. Just as in foreign countries these acts are perpetuated in order to achieve a specific political objective. The reality of the economic hitman program has become common knowledge in truth communities. Of course, this was (and in many cases, still is) the program run by the NSA which used contracted operatives to travel overseas and to compromise foreign government heads and then turn them so that they work solely for Western corporate interests. If the foreign leader does not concede, other methods are then employed. One of the main ways in which Western elitists compromise governments is by hiring thousands of astro-turf protesters to create the illusion of public outrage. These tactics are repeated in the hopes that the foreign leader will attempt to save their reputation and give in to Western demands. However, protests alone are rarely sufficient in causing any real change. Only by bribery, threats, character assassination, and/or actual assassination do foreign leaders relinquish their countries to Western rule. If the leader is successfully outed or killed, the Western corporate interests quickly install their own patsy to do the bidding of Western elitists. It was John Perkins who first revealed the reality and dangers of the economic hitman program in such a public way. Perkins worked as an economic hitman for years on end. However, due to an act of conscience, he turned whistleblower and now spends his time informing the public about the threat which economic hitmen have been in the past. Since the election of President Trump, this method of governmental manipulation appears to have been attempted on American soil by various interests still faithful to corporate criminals. However, the tactic does not appear to be working. We can see signs of this same manipulative behavior in the West's propaganda campaign against Russia. For years now, Russia has been a constant object of reprisal and demonetization at virtually every turn. Even when Russia assisted in defeating ISIL, U.S. media did everything they could to discredit their efforts and to reflect them in the worst light possible. It eventually became clear that there were political agendas which involved these propagandistic efforts by the Western MSM. However, there did not appear to be any motive behind these efforts initially. It was not until the disclosure of the Uranium 1 scandal that it became more clear of what was happening and why Western media was trying so desperately to demonize the Russians in virtually every news broadcast. It was believed that the typical Western scam of entrapment was the motive behind the uranium smuggling by Democratic officials. Apparently, these Western interests intended to secretly hand the evidence to their intended mark (in this case, Russian officials), and then when the time came, they would swoop in and pretend to be the heroes who were stopping the evil Russians from doing harm to the world. It was suspected that just as in the case of the second Iraq war, the Deep State intended to use the uranium as an excuse—a second revelation of weapons of mass destruction—to start nuclear war with Russia. Yes, this would be an act of insanity by elitists and may sound unlikely. However, it should be noted that those who sit at the upper echelons of the corporate world very much appear to be insane, and believe they are acting for the greater good by drastically reducing the world's population. Many researchers suspected this to be the case, seeing that it was shown to be the intent of the Western financial interests years prior. It appeared to be simply yet another attempt of world manipulation, government manipulation, and warmongering. However, fortunately for the planet, the anti-Russia scheme was uncovered before any real war ensued. Presently, it seems that the same or similar interests which have confessed to manipulating foreign and domestic heads of state to the benefit of a few ruling elitists, the incident known as the Newburgh sting showed us the true story which the MSM may never reveal. With these facts in mind, the view of our present situation may change. It does not take too much intelligence to realize that these deceptive tactics of the FBI have been used on multiple occasions by American agencies and corporations. It does appear that FBI officials and the lawyers involved with this case were, in fact, telling the truth when they disclosed the intel about how the FBI has employed their deceptive tactics multiple times. So why is it that the corporate media has made no effort to bring these deceptive, clandestine efforts of the FBI to light? We may observe the fact that the media has persisted at promoting the disarmament of the public under the myth that government will respect the rights of citizens afterward. The reality is that for the past decade and longer, the U.S. government has shown virtually no interest in upholding the rights of citizens. In fact, we can clearly see when supposed acts of terrorism were repeatedly used as excuses to abolish constitutional rights altogether—those being the 1st, 2nd, 3rd, and the 4th Amendments. The 1st and 2nd Amendment were attacked after Parkland (among many cases). The 3rd was attacked after the Boston marathon incident and the 4th was abolished after 9/11. All of these tragedies showed many signs of being manufacture terror events as well—complete with actors, fake MSM news reports, and official patsies. If we were to look back into past news reports, how many supposed terrorist attacks would we find to be fabricated by authorities and news personnel—two, five, ten? Which of them were real? Just one of these false events casts serious doubt upon the integrity of the United States government, not simply due to the presence of Trump in the White House, as this issue ballooned long before Trump ever entered the presidential seat. No, this problem of a deceptive, out-of-control FBI, CIA, NSA, and government as a whole came decades ago. It is only now that it has been made clear. The fact that the corporate media is currently presenting yet another allegedly violent event via the Parkland school shooting, and yet the fact of a dishonest and corrupt FBI is not being openly discussed most certainly raises the question of whether or not the Parkland event was anything more than another false flag. It shows that disclosure of official and media corruption has not yet reached the necessary point of honesty. Until we as a nation fully acknowledge the gross negligence and corruption present in our three-letter agencies, these agencies will remain free and clear to manipulate the public in similar ways as they have in the past. As we have discussed, this deception is never in the interests of the common people, but only serves the ruling elite. When we realize this unmistakable pattern of history and recent events, we will realize how vital it is that we question the news we receive from MSM (or anywhere, for that matter) and truly search for answers as to whether or not we are receiving the full story. Review - Pentagon Caught Paying PR Firm $540 Million to Make Fake Terrorist Videos - Demonstrating America's Real Stance on "Fake News"